Maybe I am a little behind the times, but I missed this great documentary when it premiered on PBS last year. Luckily for me, the three-part series is available on NetFlix, and is totally worth the time. Each episode is 55 minutes long, so it can be easily broken up over three evenings. This production talks about Superheroes, as indicated in the title, but it discusses them in their purest form: Comics. I love comics, and for me they are the canon of the superhero world. Whenever a movie comes out and it doesn’t agree totally with the comics, I always think to myself, “That’s not what really happened.” Somehow, because this is where they originated, comics have always held a stronger value for me. This film starts at the beginning of Superheroes in the comics. The 1930’s and Superman. That’s where it all began. Say what you will about Big Blue, but he was the original, and without him, you wouldn’t have Batman, or Spider-Man, or Wolverine, or the Avengers or any of it. It all started with this creation by two boys name Jerry Siegel and Joe Shuster. This film does a great job of setting the historical atmosphere for the early days of comics and Superheroes. I think this is very important, because understanding Superman in his historical context helps us understand why he is such a goody-two-shoes. That was what was expected at the time. Plus, with the depression and the war in Europe, we needed a hero who was above it all and could do all the amazing things he could do. This film also talks briefly about the boys who created Superman personally, and how that influenced how he looked and what powers he had. IT was very interesting. Of course, as Superman became more popular, we begin to see the rise of more heroes. Many are copycats of Superman. Many others are copies of what was found in another medium of the time, the Pulps. This is where some of the darker, non-comic heroes lived, like the Shadow, who was a big influence on Bob Kane’s “The Batman.” The Batman was really something else, as this film discusses. He wasn’t from another planet, or have magical powers. He was just a normal person who put on the tights and fought crime to avenge the death of his parents. While hitting on the bigger names like Batman and Superman, the film also mentions some of the lesser known heroes like Bullet Man and the Blue Beetle. It describes how many of the titles were so similar to each other, and all of them were trying to catch up to Superman. I love that this documentary talks so much about the History that was happening in the United States as comics hit the scene and so on. The next segment in this first episode goes into WWII, and the United States joining the War. This presented a problem for the writers of Superman. He was a man who could single-handedly end the war in one day if he wanted to, so how would he fit in with what was happening? This is also where we see the emergence of Captain America. He was of course, very popular during WWII, and everyone could get behind his patriotic message. More importantly, Joe Kirby’s art was monumental with Captain America. They discuss this in detail in the movie and talk about how there was just so much movement in every panel. As more and more women were going into the workforce to do their part in the war effort, society was becoming more receptive to a super heroine. Enter Wonder Woman. She had the basically the same powers as Superman, with the addition of the lasso of truth. She believed in sisterhood and women’s rights. She was ahead of her time. The first episode ends with the 1950’s, which was a rough decade for the comics industry. The things being portrayed in the books were being called into question. The film discusses how comics are linked to delinquent behavior and how congress ends up setting up a watchdog organization and a comics code to make sure that the content is all appropriate in each title and issue. many titles were not allowed to continue, and those that were were strictly monitored. At the same time, TV was catching on, and it didn’t take long for superheroes to show up on the small screen. Superman, again was the first. He now represented Truth, justice, and the American Way more than ever, in an attempt to win over the people who now believed that comics led to juvenile delinquency. All of that was the first episode. It was great to see the origins of the comics I grew up reading and seeing how the outside world influenced the stories and the content in the books. IT was also interesting to see how this truly American art form began to take shape and change over time. The second episode begins with the 1960’s which means we see the beginning of Stan Lee and his work, and how it was much more relatable than what was in DC at the time. I don’t want to give you a whole rundown of everything in the show, but I recommend checking it out on Netflix. It will be worth your time. It explains the difference between DC and Marvel better than most things that are out there, and gives historical context for why the difference is there. Superman has always been my favorite superhero, but honestly, the Marvel heroes are much easier to understand and identify with. Yes they have amazing powers, but really they are just regular people, just like me. 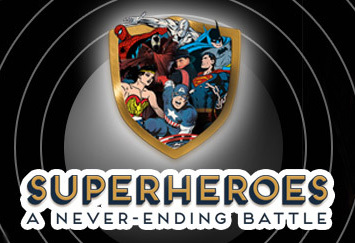 Again, check out this three-part documentary called Superheroes: A Never Ending Battle. It is available right now on NetFlix. It is also a PBS production, so you can also find it at PBS.org to purchase. Worth the time, I promise, if you are into Superheroes at all. This entry was posted in Movies, Random Ramblings and tagged Batman, Comics, DC, Marvel, SpderMan, Superheroes, Superman, Wolverine on July 17, 2014 by Jake Dietz.